Forming, Thermoforming, and Heat Forming are universal terms for a variety of thermoplastic sheet-forming techniques. All of these forming methods require a pre-manufactured thermoplastic sheet. The process involves heating the plastic sheet to its forming temperature before stretching the softened sheet against a mold. When the sheet has cooled to the point where it retains the shape of the mold, the sheet is removed and the forming procedure is complete. 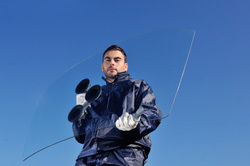 Laminated Plastics can then provide a multitude of post-machining operations and other value added options such as polishing, finishing, and hardware installation. These value-added options transform the material into a fully functional, ready-to-use part for your application. 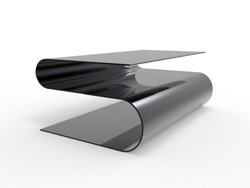 Laminated Plastics specializes in Drape Forming, which involves heating a plastic sheet to its forming temperature before manually shaping the sheet over a form or mandrel to replicate the desired shape. This method is used when the plastic part requires a more transitional or gradual bend. Our Drape Forming process is excellent for producing large-radius curves in plastic panels and for making tubular and conical shapes. This method is particularly effective for large components and thick-section materials. Various sections of the formed part can then be bonded together seamlessly to create curved, multi-sided panels, shaped housings, and custom beveled enclosures. A major benefit of Drape Forming is the low cost of tooling and fixtures. Additionally, during the Drape Forming process, the sheet is generally not "stretched", thus the plastic retains the full dimensional thickness of its original flat form. Regardless of whether the now curved panel is clear or textured, it will fully retain its surface features post-processing. Plastic bending can be accomplished using several techniques. Line Bending is an efficient process for creating one or multiple tight-radius bends in most formable sheet plastics. Line Bending is a thermoforming or heat-forming process, which involves heating a thermoplastic sheet material over a strip heater until it becomes soft and pliable. Once softened, the sheet, rod, bar, or tube is placed over a precision former to produce a perfect radius angle or bend. Once cooled, the plastic retains the specified shape and is accurately produced per ISO 9001 and AS 9100 quality standards, ensuring bend radii, curvature and angles are exactly to customer drawing specifications. Most applications for Line Bending tend to focus on single or double parallel bends to create objects such as rectangular covers and equipment housings; however, some fairly complex forms can be manufactured using this technique. Some plastics can be bent using a press brake, which is the same equipment used for bending metal. The material thickness helps determine the probability of success with this method. Materials measuring 3/16" thick or less are typically candidates for Break Bending, with Polycarbonate, Acrylic, PVC, and Kydex being the primary materials that lend themselves to this process.